This is the best quick kids story to read. In a little village, far away, there lived a Brahmin and his wife. The two were very unhappy because they had no children. One day, at last, the woman had a baby but strangely enough, the baby turned out to be a snake. Their friends are relatives were shocked and told them to get rid of the snake. The couple did not agree. They loved their son very much even if he was a snake. You may also like to read, A Little Mouse Who Was A Princess. Several years passed and the snake grew up. The mother began to think of getting her son married to. One day, when the Brahmin came home, he found his wife in tears. “What is the matter? Why are you crying?” asked Brahmin. “Our son is old enough to get married yet no one wants to marry him. Please, find him a bride!” cried his wife. 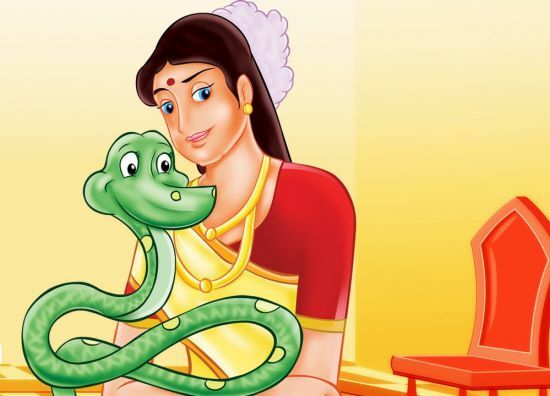 The Brahmin set out to search for a bride for his son.But, as soon as the girl found out that his son was a snake, she would get frightened and run away. Finally, the Brahmin went to visit an old friend of his. “What brings you to this town?” his friend asked him after he had welcomed him. “What can I say! I have traveled far and wide searching for a bride for my son but I was unsuccessful,” wailed the poor Brahmin. Also, read The Prince With Donkey Ears. As soon as his friend heard this, he jumped up and exclaimed, “Why did you not say so before? I’ll give my daughter as bride to your son.” The Brahmin tried to explain about his son but in vain. In the end, he left for his village with a bride for his son. As the day of the wedding approached, all the neighbors gathered to warn the bride that she was about to marry a snake but she would not listen to them. The wedding took place. The girl was devoted to her husband, the snake and did everything that a good wife should. Every night, she would lay him down in a warm and cozy box. One night, the girl saw a handsome, young boy in the room. She was terrified and tried to run away for the man caught her hand and had stopped her. “Don’t be frightened! It’s me, your husband!” cried the boy. Seeing that she did not believe him, he transformed into a snake and back into a man. This would happen every night. The man would leave his snake skin behind and spend time till dawn with his wife. One day, the Brahmin saw what happened through the window. He rushed into the room at once, seized the snake skin and blew it into the fire. The son was released at last. He thanked his father for saving him from the terrible curse that had bothered him all his life. You may also like to read, The Old Woman Who Lived In A Shoe Summary.